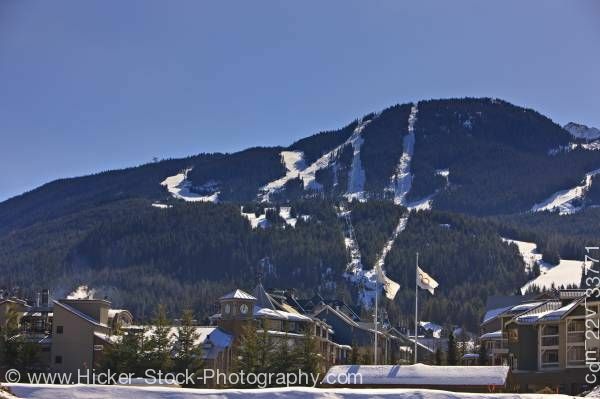 Stock photo of Whistler Mountain and Whistler Village as seen from the Summit Lodge in Whistler Village, British Columbia, Canada. Snowy ski trails really stand out from summit to base in this pretty Winter scene. View of Whistler Mountain (2182 metres/7160 feet) and Whistler Village seen from the Summit Lodge, Whistler Village, British Columbia, Canada. Whistler Mountain is a peak in the Fitzsimmons Range on the northwestern edge of Garibaldi Provincial Park, and the location of the ski resort and the town of Whistler, British Columbia. The original name of the mountain was London Mountain, named after a mining claim in the area, which in turn was named for the heavy fog and rain of the area. The locality was called Alta Lake before the creation of the Resort Municipality of Whistler in the 1970s, but the mountain's name had already been changed in 1965 as the associations with London's bad weather were deemed to be bad for advertising purposes. With the advent of the ski resort in the late 1960s the name was changed to "Whistler" to represent the whistling calls of the marmots, which are also known as "whistlers", that live in the alpine areas of the mountain.